Shape refers to the contour and form of the stone. 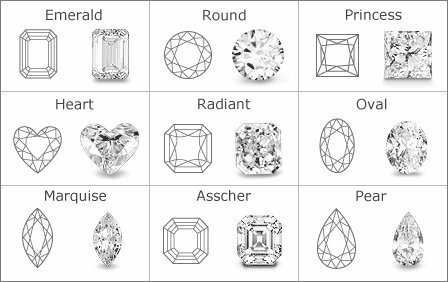 The most popular shape is the round, as the symmetry allowed with rounds leads to the most brilliant and reflective diamonds. Other popular cuts include Princess, Oval, Pear, and Emerald cuts. Diamonds are weighed in metric carats. The carat is a unit of mass equal to 200 mg (0.2 g; 0.007055 oz). The current definition of the metric carat was adopted in 1907 at the Fourth General Conference on Weights and Measures. The carat is divisible into one hundred points of two milligrams each. Therefore 0.50 carats can also be read as 50 points. Cut refers to a diamond's proportions - symmetry and polish. This includes the facet and body angles. A round brilliant cut diamond has 57 or 58 facets, the 58th being a tiny flat facet at the bottom of the pavilion that's known as the culet. The large, flat facet on the top is the table. 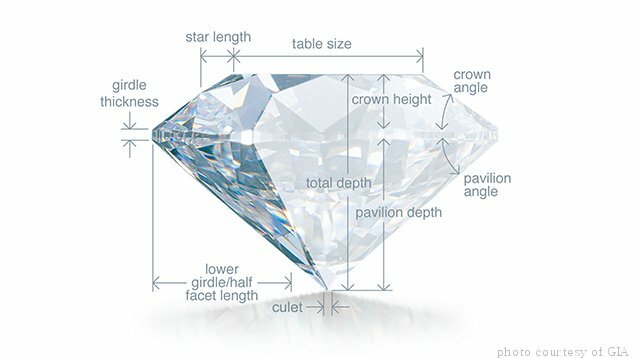 The proportions of a diamond refers to the relationships between table size, crown angle and pavilion depth. A wide range of proportion combinations are possible, and these ultimately affect the stone's interaction with light. The more ideal the ratio for the reflection of light (brilliance), the higher the rating of the diamond cut grade. 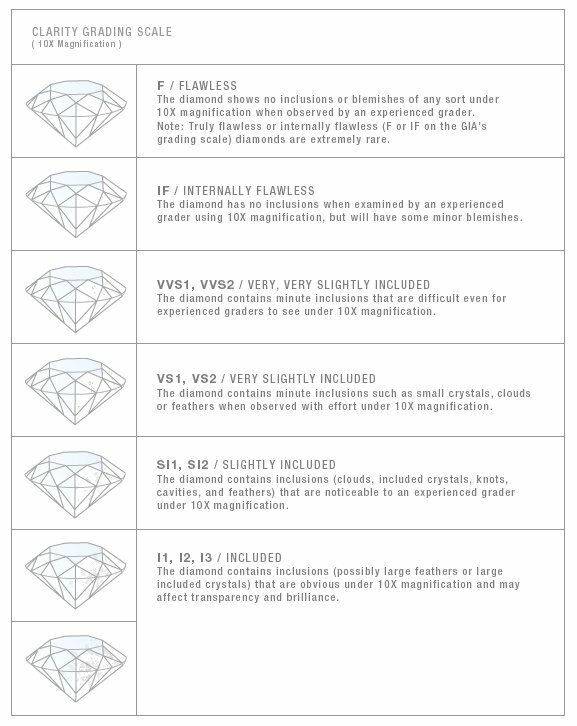 Diamonds are graded based on a D to Z color grading scale. The scale begins with the letter D, which is absolutely colorless, and continues with increasing presence of color, to the letter Z. These distinctions are very subtle, and it takes a trained eye to distinguish between these colors. Naturally colored diamonds, known as "fancy colored diamonds," are less common, and usually more valuable than their colorless counterparts. Fancy colored diamonds can range in intensity and distribution of color and are generally priced based on these guidelines; the more intense and evenly distributed the color, the higher the value. Fancy colored diamonds come in yellow, pink, blue, red, champagne, and other colors. Colored diamonds have become increasingly more popular over the past couple of years and JWG Group has a unique collection of both fancy colored diamond jewelry and loose diamonds available. Diamond clarity refers to the internal and surface characteristics of a diamond, often referred to as inclusions and blemishes. Inclusions may be crystals of a foreign material or another diamond crystal, or structural imperfections that can appear whitish or cloudy. The number, size, color, relative location, orientation, and visibility of inclusions can all affect the relative clarity of a diamond. A clarity grade is assigned based on the overall appearance of the stone under ten times magnification. A diamond certificate, also called a diamond grading report, diamond dossier®, or diamond quality document, is a report given to individual diamonds by a team of certified gemologists that require the diamond to be analyzed, measured, and evaluated using trained eyes, a jeweler's loupe, a microscope, and other industry tools. A completed certificate includes an analysis of the diamond's dimensions, clarity, color, polish, symmetry, and other characteristics. 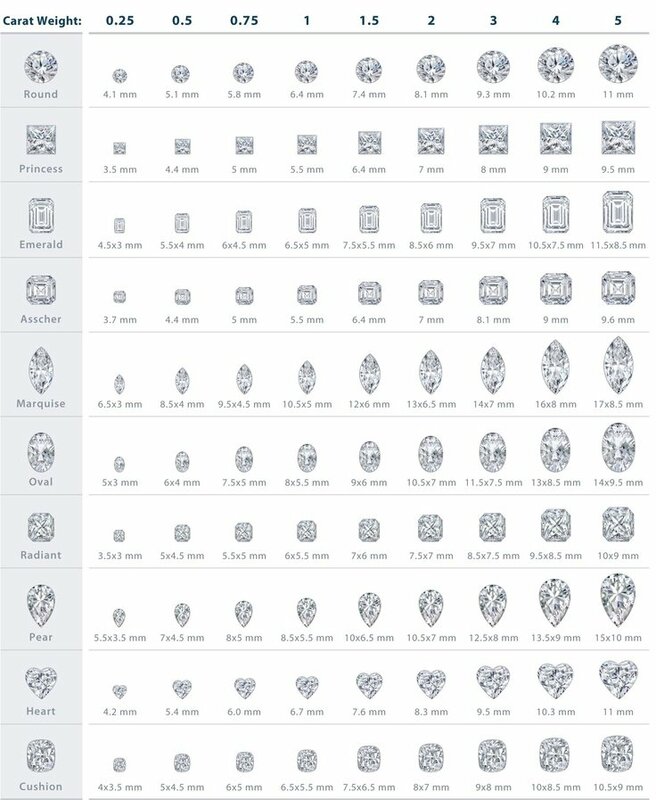 Many round diamonds will also include a cut grade on the report. 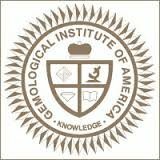 The most common certifying agency is the Gemological Institute of America, or GIA. Their grading criteria are widely accepted, and they are heavily involved in standardizing the grading classifications.